Gas exchange is the process by which oxygen and carbon dioxide move between the bloodstream and the lungs. This is the primary function of the respiratory system and is essential for ensuring a constant supply of oxygen to tissues. This article will discuss the principles of gas exchange, factors affecting the rate of exchange, and relevant clinical conditions. 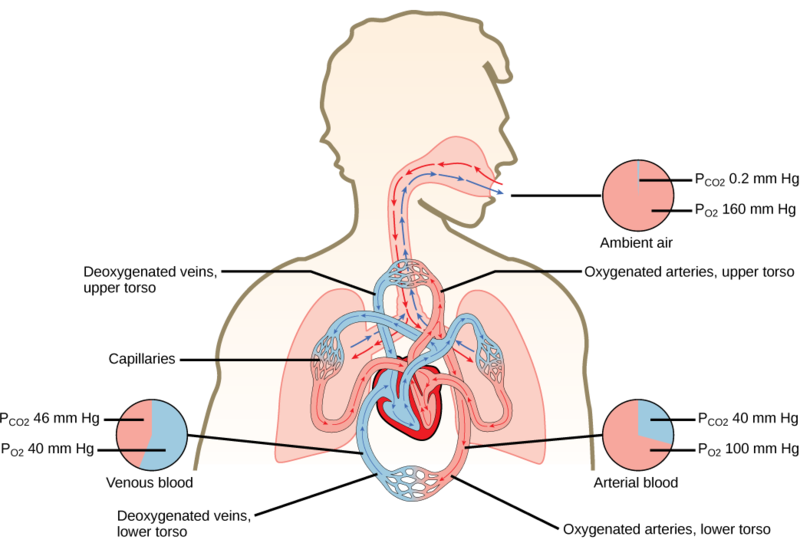 The movement of gases in a container (in this case, the lungs) is random, but overall diffusion results in movement from areas of high concentration to those of low concentration. This happens because gases will expand to fill the available volume. Collision of the molecules of gas with the sides of the container results in pressure, defined by the equation below, in which n represents the number of moles, R the gas constant (8.314), T the temperature and V the volume of the container. In other words, the lighter a gas is, the more rapidly it will diffuse. In this situation oxygen, being smaller than carbon dioxide, would diffuse faster. When gases are diffusing through liquids, for example across the alveolar membrane and into capillary blood, the solubility of the gases is important. The more soluble a gas is, the faster it will diffuse. In this case carbon dioxide diffuses much faster than oxygen, as it is much more soluble. In the lungs, whilst oxygen is smaller than carbon dioxide, the difference in solubility means that carbon dioxide diffuses roughly 20 times faster than oxygen. Normally this is compensated by the large difference in partial pressures of oxygen, however, this means that in disease, oxygen exchange is often compromised before that of carbon dioxide. The partial pressure of oxygen is low in the alveoli compared to the external environment. This is due to continuous diffusion of oxygen across the alveolar membrane and the diluting effect of carbon dioxide entering the alveoli to leave the body. Despite this, the partial pressure is still higher in the alveoli than the capillaries, resulting in a net diffusion into the blood. Once it has diffused across the alveolar and capillary membranes, it combines with haemoglobin. This forms oxyhaemoglobin which transports the oxygen to respiring tissues via the bloodstream. Further information on the transport of oxygen within the blood can be found here. During exercise, blood spends around half the normal time (1s at rest) in the pulmonary capillaries due to the increase in cardiac output. 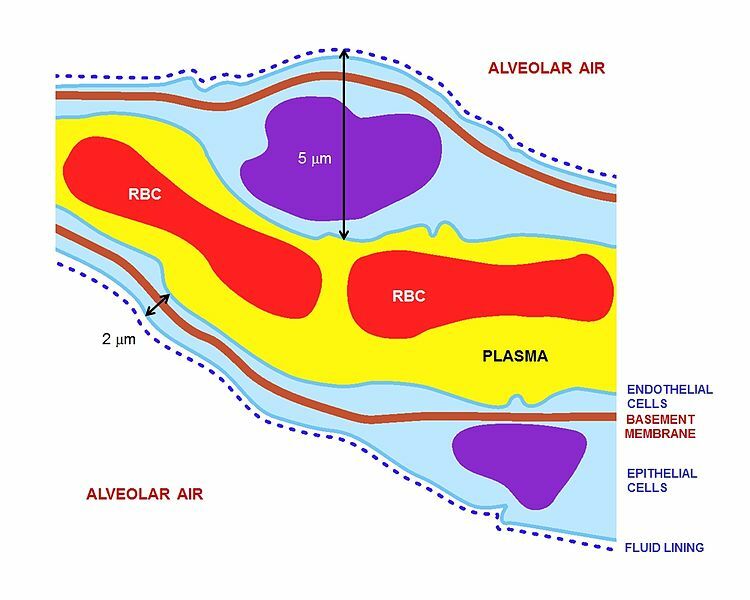 However, diffusion of oxygen is complete within 0.5s of the blood cell arriving in the capillary, which means that exercise is not limited by gas exchange. The partial pressure of carbon dioxide in the capillaries is much higher than that in the alveoli. This means that net diffusion occurs into the alveoli from capillaries. The carbon dioxide can then be exhaled as the partial pressure in the alveoli is also higher than the partial pressure in the external environment. However it is important to note that these pressure differences are much smaller than those for oxygen, as carbon dioxide is able to diffuse more rapidly. Carbon dioxide is transported in the blood in multiple ways; including dissolved, associated with proteins and as bicarbonate ions. Further information on transport of carbon dioxide in the blood can be found here. Fluid in the interstitial space (pulmonary oedema). 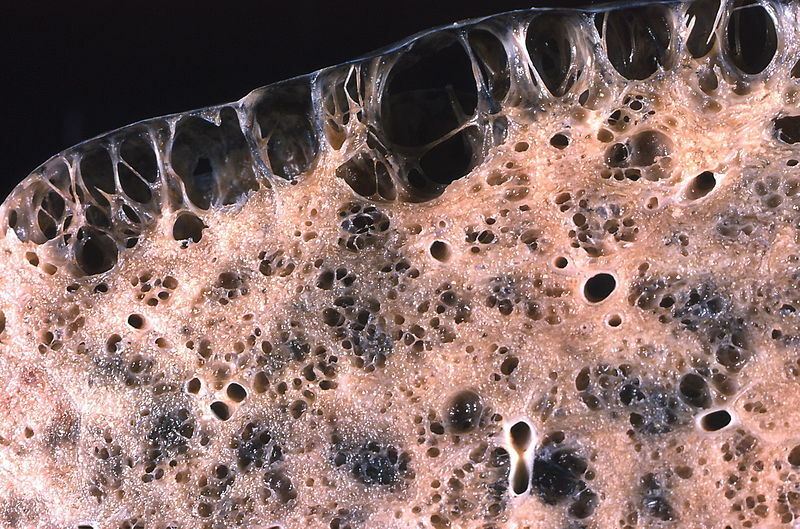 Thickening of the alveolar membrane (pulmonary fibrosis). Membrane surface area – the larger the surface area, the faster the rate of diffusion. The lungs normally have a very large surface area for gas exchange due to the alveoli. Diseases such as emphysema lead to destruction of alveoli, with formation of larger bullae. This reduces the surface area available and slows the rate of gas exchange. Emphysema is a chronic, progressive disease that results in destruction of the alveoli in the lungs. This results in a greatly reduced surface area for gas exchange in the lungs, which typically leads to hypoxia (Type 1 respiratory failure). The main symptom is shortness of breath, however patients may also experience wheezing, a persistent cough or chest tightness. The main cause is smoking, and emphysema, alongside chronic bronchitis are the conditions that make up Chronic Obstructive Pulmonary Disease (COPD). Whilst smoking is the most common cause, other risk factors include exposure to secondhand smoke, exposure to fumes/dust at work and living in areas with high levels of pollution. How much faster can carbon dioxide diffuse in a liquid, compared with oxygen? How thick is the diffusion barrier in the lungs? Which is the correct pathway for an oxygen molecule ? Which of these factors affecting the rate of diffusion is effected in emphysema?